If you want to see more high-quality pictures of organisms from the temperate rainforest and other biomes, click here! If you want to know more about Marietta College's Biology and Environmental Science Program, click here! Hot. Dry. That would seem to sum it up, but there is more to climate in the desert. First, there is more than one type of desert. We will consider two desert types, subtropical (hot) and temperate (cold). The ranges for temperature and precipitation are shown in the figures below. Note that in both cases precipitation is low, less than 100 cm per year. At the higher end of this range, most of the precipitation tends to fall during one season, with the effect that water is in short supply for much of the year. Why are there 3 diagrams? Remember the confusion in defining some of the biomes (if not, click here)? It all depends on how you define a desert. The temperature range for the subtropical desert in the top left figure goes too far to the right. The temperate grassland and desert biomes outlined in the second graph are not separated; the desert part of this would be the drier part. Finally, if one inserts the woodland biome into the figure, as many ecologists do (bottom figure), the temperate grassland and desert are displaced to the colder range of the subtropical desert range. Remember that biomes are human constructs, and that in nature there are not fences around each of the biomes, with little gates so you know when you are entering and leaving biomes. They grade into each other (more on this below). In any event, what we will call subtropical desert is fairly warm, with average annual temperatures above 10� C and precipitation up to 100 cm/year. The temperate desert is less well-defined, but again precipitation is less (usually much less) than 100 cm/year and average annual temperature is less than 10� C.
The map to the left above reflects the distribution of subtropical deserts. Most of these are located at the latitudes of 30� North or South latitude; this is where air that was warmed at the equator falls back to the ground as cool, dry air (having lost its water as it rose wet and steamy over the equator). These dry winds dry the land except for areas which are wetted by onshore breezes from warm offshore waters, such as the Gulf coast of the United States or the eastern coast of Indochina. Temperate deserts occupy the drier parts of the shaded areas in the map to the right. In some of these areas it is difficult to distinguish "grassland" from "desert". 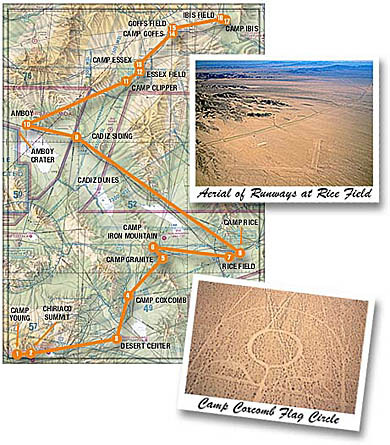 This web page has more on some of the confusion regarding what is a desert in the United States. Many of these are inland areas separated from oceanic moisture by mountain ranges; examples would be the Gobi Desert of Mongolia (the Himalayas) and the Great Basin of the southwestern US (The Sierra Nevada). More on deserts here. Reduction of leaves, often into spines for protection (above). The flat surface of normal leaves provides a huge area for water loss. Development of the stem as a major photosynthetic structure (above right and right). With leaves reduced, photosynthesis has to occur somewhere. Water storage in the stem (above, right). Water is needed for many things; if the plant is to have it available it must be stored. Development of defense structures (above, right, below right). The most common are reduced leaves that take on the form of spines, but chemical defenses are also very common. With less photosynthesis taking place, growth of desert plants is often very slow, and under these conditions it is advantageous for the plants to make greater investments in defense. Coating the plant with a thick waxy cuticle (above and below right). This helps reduce water loss. A dense coating of hairs (trichomes) (below). This slows air moving over the surface of the plant; since air in the desert is very dry any air movement tends to increase evaporation. The trichomes create a microlayer of humid air around the pant, particularly in the vicinity of the stomata. Extensive underground root systems (not shown). These roots can either grow straight down to groundwater, if it is available, or spread out extensively under the surface of the desert. The latter growth form allows the plant to take advantage of short, intermittent rains. Key in this strategy is elimination of competitors' roots; many desert plants inject toxic chemicals into the soil to kill their competitors roots, a phenomenon known as allelopathy. Trichomes - Close-up view of image to left. 1. A nocturnal lifestyle, which keeps them out of the heat of day (and out of human sight as well). 2. Living in burrows, which are cooler and more humid. This often goes along with #1, the burrow becomes a place to sleep during the hot day. Burrow diggers are called fossorial, as opposed to tree-living animals which are called arboreal. 3. Slender bodies with long limbs - these are better for shedding heat. 4. Adaptations for reducing water loss - specialized snouts, waxy body coatings, efficient kidneys, etc. are all part of this strategy. Some animals - i.e. the kangaroo rat - are so efficient that they never need to drink liquid water; they get all their water from the food they eat (including the water released when sugars are respired to form CO2 and water). 5. Eyes protected from the sun (for diurnal species). Long eyelashes or deep-set eyes not only reduce harsh sunlight but reduce evaporation from the eyes. Note that the animals shown here all break with one or more of these adaptations. The zebratail lizard (right) has a slender body and long slender limbs, and its eyes are set deeply, but it is diurnal. The rock hyrax (lower right) is also diurnal, does not burrow (although it frequents natural crevices in rocks), has a stumpy body and its eyes actually protrude. The camel is very large, diurnal (at least in captivity) and, believe it or not, does not burrow. The Bactrian Camel shown here is native to cold deserts of Asia (such as the Gobi); the one-humped Dromedary Camel is found in subtropical deserts such as the Arabian desert. The eyes of camels (left) and Zebratail Lizards (below) are both protected from harsh desert conditions. The camel has very long eyelashes while the eyes of the lizard are recessed. Dust, bright light and evaporation are all problems faced by desert creatures. Now, obviously the desert has a lot of sun. The dry air of the desert forms few clouds to block the sun. Likewise, desert soils are often rich in nutrients simply because there has been little rain to wash them away. In fact, some deserts may have saline soils, where both nutrients and salts have accumulated in large numbers; even if it rains in such locations it might be hard for plants to grow as the resulting soil water will be too salty for the plants. Warm temperatures are needed for plants to carry out photosynthesis, in particular the temperature must be above freezing if liquid water is to be available for the plants. Subtropical deserts, at least, have little trouble here most of the time. Obviously, the big problem for deserts is the lack of water. Not only does little rain fall, but that which does may quickly run off or be evaporated by the harsh sun. Desert plants often resort to C4 or CAM photosynthesis as opposed to the normal C3 photosynthesis used by plants not stressed by water shortages. Compared to C3 photosynthesis, both C4 and CAM photosynthesis are more efficient under hot, dry conditions, but this ability to work under water stress comes at a price - these types of photosynthesis are not as efficient overall, and therefore are able to fix less carbon dioxide in a given period. As a result, growth in desert plants is very slow. This makes deserts particularly slow to respond to human activities. If you don't know the differences between the 3 types of photosynthesis, look here. Outside of the rather bizarre drive to develop the desert, there are a number of other threats. With little rainfall to leach away minerals (and with minerals sometimes trapped in evaporation basins), mining is common in desert areas. Some areas are irrigated for agricultural purposes. This may work in the near term, but if water is not supplied in enough abundance to flow off the land and carry away salts then those salts will build up, leading to salinization of the soil, and its eventual abandonment as salt levels become too high to support plants. Another form of agriculture, grazing, can have severe impacts as well. Because the grazing animals are often placed on the land for a short time, or because their food and water may be supplemented, grazing animals are often placed in deserts at far greater frequencies than the land would normally support. The high level of grazing can destroy or alter native plant communities, and the grazing animals themselves can trample and kill an assortment of desert plants and animals. Plants introduced as forage, often from other continents, may become invasive and threaten native plants, as can non-nutritive weeds introduced with the seeds of the forage plants (see the saga of the tumbleweed, below). Off-road vehicle use is another threat. Recreational off-road vehicle use may kill or crush plants and animals in the way. By its very nature, such off-road use is usually not confined to single tracks, but spreads out to cover wide swaths of desert. Even where there are no plants and animals, the desert is often covered with a fragile "desert pavement" of stones and an intriguing biofilm of bacteria and volatile plant products (collectively called "desert varnish"). Vehicles disrupt the desert pavement and varnish, leaving the soil underneath open to wind erosion. Because the plants in the desert are slow to grow, such damage can remain for a long time; tracks of tanks and other vehicles training for or participating in battles of WWII are still visible 65 years later (see this too). A good article on this can be found here. For that matter, I've hiked in the ruts of wagons that ran the Santa Fe Trail 100 years earlier. Global warming is also a potential threat; it's hard to imagine that a slightly warmer desert would be any worse than some of the hot deserts now. However, even small changes in temperature or precipitation may have extensive impacts on desert communities. In some cases, global warming is predicted to increase the area of deserts, but it is not clear if desert plants and animals will be able to take advantage of this. Also, it should be noted that human activities such as firewood gathering and grazing are converting fragile grasslands into deserts, a process called desertification. Chihuahuan Desert: A small area of southeastern New Mexico and extreme western Texas, extedning south into a vast area of Mexico. Sonoran Desert: A relatively small region of extreme south-central California and most of the southern half of Arizona, east to almost the New Mexico line. The definitions above come from DesertUSA, see their home page here. We will concentrate here on the Sonoran Desert, which is subtropical and one of the most biologically diverse deserts in the world. Most of the photos here are from extreme southern Arizona near the Mexican border; the photo at the right above shows a portion of the Sonoran Desert where the large saguaro cactus is still extant. That photo was taken in a national park, the other photos show landscapes more altered by humans, including attempts at making the land suitable for grazing by the introduction of various grasses. In the desert one expects to see cacti. Strictly speaking, the cacti are less a taxonomic assemblage than a functional one; plants from various taxa have taken on cactus-like characteristics as they adapted to dry conditions. What are these cactus-like characteristics? A succulent growth form with leaves reduced into sharp protective spines and photosynthesis taking place in the thick, water-retaining stems. Because cacti are flowering plants, their flowers often give away their botanical roots and allow botanists to see past the cactus growth form to determine from where in the botanical kingdom the plant in question came from. Even within a taxonomic group the growth forms can be confusing; both the Cholla and the Prickly Pear (left) are in the same genus, Opuntia. One does not expect to see aircraft and housing tracts in the desert, but there they are (above). We've already explained the housing, the aircraft are being stored there. The dry conditions mean that planes can be stored in the open with minimal maintenance (mostly just placing seals over the engines and changing out tires). Some airlines place older planes here to be recalled to service during busier times; other planes belong to airplane brokers looking to store their inventory. The United States military also stores a lot of older equipment in the desert for the same reason. A lot of military training takes place in deserts because the clear weather makes training easier (although one wonders how realistic the training will be if the war is being fought in forest or taiga). More desert animals: As every schoolchild knows, the hump(s) of a camel are filled with fat, not water. What isn't undertstood as well, hwever, is that the fat serves as both a source of food AND water (not to mention insullation from the hot sun). As the fat is metabolized, it is broken down to produce energy, carbon dioxide, and water, which reduces the camel's need to drink. The two-humped or Bactrian Camel (above) is resident in cold deserts while the one-humped Dromedary Camel hails from subtropical deserts. In both, thick fur on the back helps keep the sun's heat at bay; during warm weather a relatively furless, shaded undercarriage radiates heat away from the camel. The Pinyon Jay (above right), like many jays, is an intelligent bird which uses its relatively good brain to remember where it has cached food (usually acorns or other nuts). This allows these birds to inhabit areas that other birds can't, as the cached food provides for the jays year-round. This Pinyon Jay was in southern Idaho; other jays of desert-like conditions include the western and Florida Scrub Jays. The two lizards to the right are well-adapted to desert conditions. The Desert Spiny Lizard is well camouflaged and scampers about looking for insects in the underbrush, being careful to stay in the shade if conditions are too how. The Great Basin Fence Lizard (I think, the image is from a scan of a 20-year old picture) was basking on a rock in the morning at Joshua Tree National Monument in the Mohave Desert. Once warmed by the sun, it will be quick enough to catch its insect prey; in the meantime the excellent camouflage enables it to get up to speed thermally without being spotted by an alert bird such as a roadrunner. The Gopher Tortoise, below, has a different means of living in the desert. These turtles - which grow up to 2 feet long - make extensive (up to 10 meter) long burrows in the soil. It is cooler and moister in the burrow, and many other species (including owls and rattlesnakes) may share the burrow with the turtle. The tortoise is free to come out of the burrow whenever conditions are right; this may not occur for long times in the summer. The individual below was photographed in Florida. The Gopher Tortoise (Gopherus polyphemus) is now considered a separate species from the Desert Tortoise (Gopherus agassizii). The Florida Scrub in which the gopher tortoise lives is desert-like in many ways. Insects and birds: The cicada (above right) is present in many desert ecosystems. Cicadas in general have adapted to every habitat from desert to rainforest. They are all similar in their life cycle with its long underground developmental stage (a particular advantage in the desert) and their loud piercing calls as adults. The mass emergences of cicadas in the eastern United States every 17 years is a fairly unique phenomenon not seen in other habitats where a few cicadas emerge each year. The Mormon Cricket (above left) is not a true cricket but rather a type of katydid. Flightless, these crickets can emerge in large numbers during favorable conditions and their feeding can endanger crops. In 1848, a large emergence threatened the new Mormon communities in Utah; a flock of seagulls apparently ended up eating many of the crickets, an event cited as a miracle by many. The White-winged Dove (left and below) is common at the Saguaro National Park in Arizona, where it feeds on the fruits of the large eponymous cacti (note the fruit-stained bill of the gourmand in the photo at lower left). All Zebratails, all the time: One of the most conspicuous lizards in the daytime in mid-summer at Saguaro National Park, the zebratail has a number of advantages to enable it to be active in the mid-day heat. First, it can perch high off the hot rocks (note how the lizard above even lifts its toes). This avoids one of the main methods by which heat is transferred to an organism, conduction [movement of heat between objects in contact], (the others are convection [transfer from moving fluids such as air], radiation [in the form of infrared radiation] and evaporation). Note that the lizard is also pointing directly at the sun, minimizing its exposure to the infrared of the sun (and minimizing its shadow as well). The eyes (inset) are well-protected as well. Off the rocks, the Zebratail is fast and able to run down insects it's spotted. The subtropical Sonoran desert (as pictured at the Saguaro National Park) is one of the most biologically diverse deserts in the world. Above left, a mixture of Cholla and Prickly Pear cactuses as well as other shrubs and the ubiquitous saguaros show off some of the diversity. Left, a vista across an alluvial fan covered by saguaro. Below, the same vista framed by a Palo Verde tree growing on a rocky hillside. Above - even within a national park, development and mining loom large. The extinct volcano is ringed by wastes from mining operations, well within view of visitors in the park. Elsewhere housing developments approach the park boundaries. Northern Arizona desert from the air. The great southwestern desert from the air (above) shows little biology (at least from 35K feet) but a lot of geological features, many carved by water. These pictures were taken in June. Even the most desolate appearing desert, however, can show roads and other tracks, often wandering across the desert for no apparent reason (above right). A flicker (species undetermined in the reddish light of the sunset) perches near an excavation it has made in the side of a Saguaro. This bird and its mate were earlier seen returning to this cavity with insects; no doubt there were young inside. Once abandoned by the woodpeckers, such a cavity will be used by other species. Stars and deserts (below): Dry desert air far from city lights is ideal for astronomy, all the more so if the observer is located on the top of a 6800 foot mountain (thus with less atmosphere in the way). The Kitt Peak National Observatory has been here since 1958; oviously there are a lot of telescopes up there (below right). The observatory has worked closely with the growing city of Tucson almost 50 miles away (its suburbs even closer) to control light pollution which would render the telescopes useless. Climbing the mountain, one moves from the Sonoran desert at its base to a more alpine woodland near the top. The view of the desert below (below left) is spectacular. Flying over the southwest, one cannot escape the spectacle of center-pivot irrigation (above right). Fro a central connection, a long pipe supported by motorized wheels and bearing numerous sprinkler heads reaches out; driven by the wheels the pipe makes revolutions (or partial revolutions) irrigating circular or pie-shaped fields below. Systems range in size; some of the largest have a radius of 1/2 mile and the resulting circle is almost 640 acres of crops. Sources for the water vary; some use water taken from underground aquifers. Many of these contain fossil water; that is, water that is not being replaced from the surface. Even in aquifers that are being recharged, the withdrawal for agriculture may exceed the recharge rate, thus the aquifers are being "mined" of their water in an unsustainable way. Other irrigation systems may get their water from aqueducts carrying the water from dams. In either case, the desert lands of the southwest are particularly vulnerable to salinization for several reasons. First, because there has been little rain in the past, many salts remain in the soil. Second, the arid conditions lead to rapid evaporation, which leaves salts behind. Third, many of the fields are in closed basins from which the only escape for water is evaporation. Modern center-point systems often use tubes to bring the water close to the ground before it is sprayed; this greatly reduces evaporation and thus overall water use. To the right, the hard "skeleton" of the saguaro. The large cactus needs a system to support its weight (all that water it's storing weighs 8 pounds/ gallon or 1 kilo/liter). When the cactus dies, often the skeleton is left behind since it is composed of more rot-resistant substances. Below, a tumblweed, Salsola tragus. Tumbleweed is native to the Russian steppes and was apparently brought to this country in the late 1800's as seeds contaminating grains imported to farm the northern plains. It spread quickly, and is now seen across the southwest all the way to the Pacific (this picture was taken in California). The spherical plant body carries numerous seeds, which it dispenses as it rolls along. Neither of the animals arranged here are necessarily restricted to desert habitats. In fact, the rock hyrax (above) is found in most of Africa except the harshest deserts (such as the Sahara). Still, it is able to live under dry conditions. Likewise the coyote is not an obligate desert dweller; in fact, it is found almost everywhere in the United States from cold forests in the north to the deserts of the southwest, and even many urban areas in between. Because the coyote is so adaptable, it is able to survive in all these habitats. Depending on local circumstances, it may be a solitary hunter taking small prey such as rodents, or a pack hunter bringing down such large game as deer. It is always an effective scavenger, and its largely nocturnal habits keep it out of human sight most of the time. Because of their occasional depredations on livestock, humans have waged all-out war on the coyote, often using poisoned carcasses and intricate traps; these methods have driven several other species to near extinction, but coyote has survived. This wily animal can catch just about anything but a roadrunner, and it can breed with both domestic dogs and wolves. The coyotes pictured here were part of a pack encountered one morning in Theodore Roosevelt National Park in a very dry grassland habitat. Other Deserts: The Mojave Desert (above and below left) is considered by some to simply be a transition between the Sonoran Desert and the Great Basin Desert; others consider it a separate system in its own right. Certainly the vegetation is different from either of the other two deserts. Gone are the Saguaro, replaced, in size at least, by Joshua Trees, Yucca brevifolia. As the name implies, the Joshua Tree is a kind of Yucca, though taller than most; it is only found in the Mojave Desert. The Mojave encompasses a number of different habitat types as it stretches eastward from the San Bernardino mountains (which ring Los Angeles) to parts of Nevada and Arizona. It encompasses both mountains and the floor of Death Valley, 282 feet below sea level and the lowest point (an the hottest!) in the continental United States. In the picture to the right, above, as well as the picture at lower left, you can see that the plants are widely spaced. Part of this is competition for water; in order to sustain themselves each plant needs an extensive system of shallow roots which can quickly absorb any rain which falls before it evaporates. These root networks must extend beyond the plant itself, and many of the plants exude toxic chemicals into the soil to kill potential competitors for water. This chemical warfare is known as allelopathy; a common example of this phenomenon is seen in the vicinity of black walnut trees in the deciduous forest. Black walnut leaves drip hydrojuglone (the roots also exude it) which kills nearby competitors. To the left is a picture taken from the Great Basin Desert in Utah. The Geology Department at Marietta College has been digging dinosaurs out here for almost 30 years. In recent years, the Biology Department has accompanied them; you can read more about our trips here. Deserts, although they are mostly dry today, have been greatly affected by water erosion. This erosion continues today at a rapid rate in part because there is little plant cover to hold soil in place. In fact, in many places there isn't any soil at all - just large rocks and rock layers exposed to the surface. Depending on the amount of moisture and the steepness of the slope, the areas between the large rocks do harbor a good number and diversity of plants. The lichens in the photo to the left have stabilized the soil in their vicinity; the soil under them has remained in place where adjacent soil has been blown away by the wind. This leaves the lichen on an exposed pillar. If lichens - and other fungi, plants microorganisms and chemical reactions can stabilize the soil over a large area then the soil will be kept in place. This is an example of desert pavement; if this fragile crust is disturbed then wind and water erosion can take place. This is one of the reasons deserts are so fragile; the soil is held in place only tenuously. With enough water, cacti can flourish, and when they bloom they provide color to the otherwise drab desert. The photos above are of Barrel Cactus; the image to the left is of an endangered Fishhook Cactus. Ephedra (right) is common in the Utah desert. It can be dried and used to brew "Mormon Tea". The plant does contain ephedrine, which is a stimulant and decongestant. Most ephedrine used in the US is produced in China; the Ephedra there has higher concentrations of ephedrine. Lichens are associations of fungi and cyanobacteria or algae. This is a mutualistic relationship that some recent evidence suggests is more parasitism on the part of the fungus than it is mutualism where both benefit (the fungus gets sugars from photosynthesis and the algae gets waste products and water from the fungus, but the studies have shown that the algae grows better on its own). This lichen was orange and yellow instead of the more familiar green/gray of many lichens. This lichen was red and white. Rain evaporating before it gets to the ground. Even when clouds appear, the falling water may never reach the ground as it passes through the hot, dry air right above the desert floor. Let's compare the Great Basin Desert with the subtropical deserts to its south. As one moves into the Great Basin of the American west, two things happen. First, the terrain is higher (thus cooler) and second it is further from the oceans, and shielded from oceanic moisture by high mountain ranges. The desert that forms here is the Great Basin Desert. The image below right is from northern Nevada, a part of this desert. One of the main differences between the Great Basin Desert - a "cold" desert - and the Mojave and Sonoroan Deserts - which are subtropical - is the difference in vegetation. Sagebrush is a common constituent of the Great Basin Desert; cacti are rare, and overall biological diversity is much lower. Cold winter temperatures here mean that some precipitation may fall in the form of snow; in the spring there may be a profusion of wildflowers. Moving from the temperate Great Basin Desert we come to the last "desert" we will consider. This is also a temperate desert, although not everyone will classify it as such. This desert consists of the dry fringes of the grasslands of the Great Plains, as well as the interior of Washington and Oregon. This is sometimes called "sagebrush desert" and it is similar in many ways to the Great Basin Desert. For instance, Theodore Roosevelt National Park pictured here has an average annual temperature of about 4� C and receives about 40 cm of rain/year. Depending on the authority, such a climate is often considered to be desert. Sagebrush and similar plants are often dominant here, although in a distance of a few miles the ground cover can vary considerably and large extents of grassland appear interspersed with the sagebrush. A variety of grassland and "desert" species may be found intermixed in such areas. Feral (a more technical term than "wild"; feral means that the animals were domestic at one point) horses are maintained at the national park; so are bison. Above, two pictures show how biomes intergrade into one another. In the picture above, you are looking downstream on the Columbia River. In the distance you can see forests and clouds; over the horizon about 50 miles away is the Pacific Ocean, and some of the forests close to the Pacific are temperate rainforests. By the time one reaches The Dalles, Oregon, however, the surrounding habitat has changed to open grassland (above left). This quick transformation in such a short distance shows that the moisture can be removed from moist oceanic air in a short distance (in this case by the Cascade Mountains); it is this drying action that sets the stage for the inland deserts further east.The inset picture here shows the transition about halfway between The Dalles and the coast. The remaining pictures here show various aspects of the Great Salt Lake. A large example of a relatively common phenomenon in the Great Basin, the Great Salt lake sits in a closed basin, from which water escapes only by evaporation. Such basins are not at all unusual in deserts; it takes a lot of rain to cut the channels that would drain such basins and that type of rain just hasn't fallen since the basins were uplifted. The end result are dry lake beds (or nearly dry as seen in the image below right), or, in some cases, salt lakes. As the water reaches the low points, it can only evaporate and leave behind the minerals it was carrying.